Tag Archive | "Red Rainbowfish"
The Red Rainbowfish (Glossolepis incisus) is also know to tropical fish keeping enthusiasts as the Salmon-Red Rainbowfish, Irian Red Rainbowfish, New Guinea Red Rainbowfish, Lake Sentani Rainbowfish and Irian Jaya Rainbowfish. It is endemic to Lake Sentani and its tributaries located near Jayapura in Papua, Indonesia. Red Rainbowfish are found around aquatic vegetation and bogwood that is found around the margins of Lake Sentani as well as in the clear, rapidly moving waters of the lake’s tributaries where they feed on insects that drop into the water as well as a variety of plant matter. 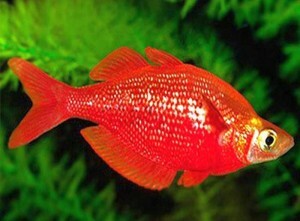 The Red Rainbowfish is a long, slender, relatively large fish that reaches a length of 6 inches in its natural habitat. Mature males have an arched back with a narrow head and the large eyes, deeply forked mouth, and two dorsal fins typical of other rainbowfish species. 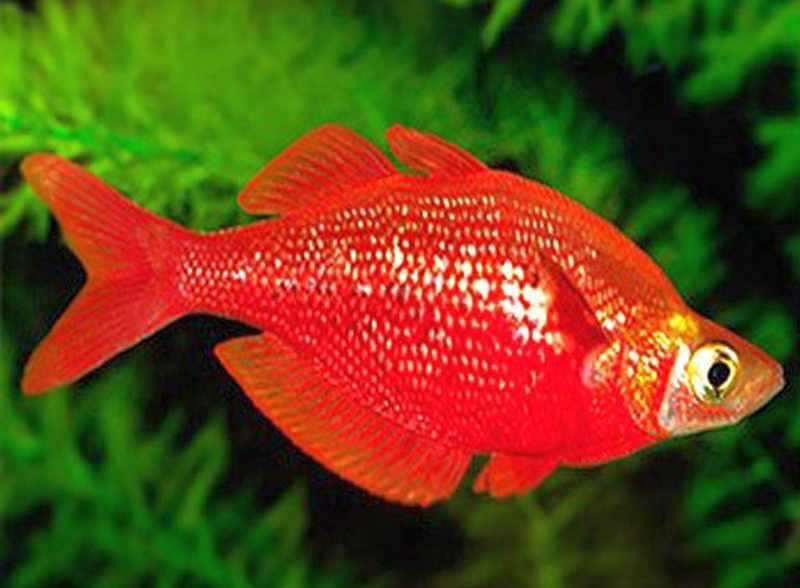 Males have a brilliant blood red body and fins accented with silver scales. Females and juvenile males are generally colored a dull olive brown with clear to gray fins. The brilliant red colors of the Red Rainbowfish are impacted by several factors including water quality, temperature, food, age, health, ranking in the school and even their mood. For example; in a water temperature of 71 to 72 degrees, all the males in the tank will be red and the females a silvery, yellow tinged color. With higher water temperatures; the dominant male will be colored red, while the other males in the tank will be reddish brown in color. 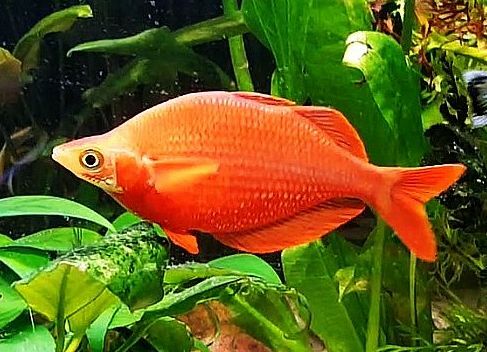 Like most rainbowfish, the Red Rainbowfish is an extremely active swimmer that should be kept with at least 6 or more of its own kind in a large aquarium environment of at least 55 gallons in capacity. As they grow, they will eventually need a much larger tank to keep them healthy. bogwood, some rock work and plenty of swimming area will suit them adequately. A canister filter and a power head will help provide the necessary current in the tank and keep the water clean. To bring out the best colors in the males, use a red spectrum light and keep the tank temperature in the 70 degree range. 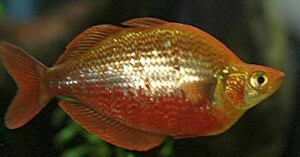 Red Rainbowfish are relative easy to breed in an aquarium environment. Set up a breeding tank with a sponge filer in a densely planted tank of fine leaved plants or a bare aquarium with several spawning mops and introduce a healthy conditioned pair of adult rainbowfish to the tank. When the female has produced her eggs, the male or males in the tank will display their intense colors and direct the female to the spawning site to spawn and then briefly rest. After spawning, the plants or spawning mop should be removed to a rearing tank for the eggs to hatch. The breeding pair will continue breeding in this manner for several days until the number of eggs produced diminishes and the female shows signs of fatigue. The eggs should hatch out in about a week at which time the fry can be fed infusoria or liquid fry food until they are able to eat newly hatched brine shrimp. The fry grow slowly and need fresh, clean water during the rearing process which lasts about two months. Do not cross breed Red Rainbowfish with other species. Red Rainbowfish require a high quality diet to promote their natural coloration. Live, frozen, freeze dried and processed foods are essential to their well being and bloodworms , tubifex worms, water fleas (daphnia ), or brine shrimp should be fed at least twice a week to supplement their prepared flake food diet. These fish are also able to eat live or freshly killed insects like flies, ants and the like. Feed them only what they can eat in 3 to 5 minutes, twice or three times a day. The Red Rainbowfish are sold as Salmon Red Rainbowfish, Red Irian Rainbowfish, and New Guinea Red Rainbowfish online and in specialty pet stores as juveniles and occasionally adults in a variety of sizes.